The Andromaches Apartments are located just outside Benitses, a small fishing village on the eastern coast of the island of Corfu (Kerkira). 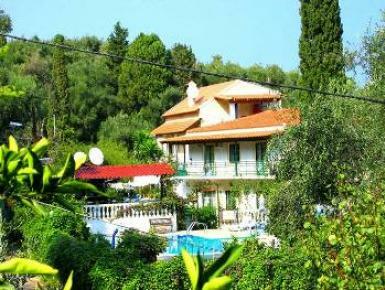 Surrounded by a large garden, the property enjoys an excellent position offering enchanting views of the Ionian sea. Minutes away from unspoilt sandy beaches, where many water sports can be practiced, the residence lies only 9 km south of Corfu town, not far from tourist facilities and a wide range of restaurants, bars and cafès. The family run structure offers a warm hospitality and a traditional Greek atmosphere, as well as an attentive service that will make your stay a pleasant one. Families with children, couples and groups of friends will appreciate the quiet setting and enjoy unforgettable holidays.